When Army Staff Sgt. Lani Yearicks was little, she learned how to crochet. Four years ago, after neglecting her skills for years, her brother invited her to take part in the prayer shawl ministry at their church. 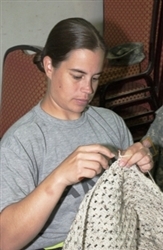 Yearicks’ crocheting came back to her, and when she deployed, she began sending prayer shawls home - until she came up with a better idea. “I was talking to my mom about the prayer shawl ministry at home, and decided to start one here,” said Yearicks, a member of the 10th Mountain Division Band. Chaplain (Capt.) Mike Jones, Task Force Mountain chaplain, helped her to develop a PowerPoint presentation to advertise her crochet and knitting group and helped her find a location for the group to meet. The shawls are being sent home to the families of fallen servicemembers and those heading home on emergency leave. The group and one or more military chaplains pray over each shawl before it’s sent, Jones said. Members of the group sit around a table talking about their week while working on the prayer shawls. Each meeting helps the individual blow off some steam and do something productive, said Army Lt. Col. Melinda Jackson, 547th Medical Company.